EASY TO ASSEMBLE - Spring Pins Construction helps to put its 5 parts together in minutes with no tools. EASY TO FIT - The attachment steel chains make it easy to fit the hammocks perfectly and easy to adjust the height of the hammock off of the floor. 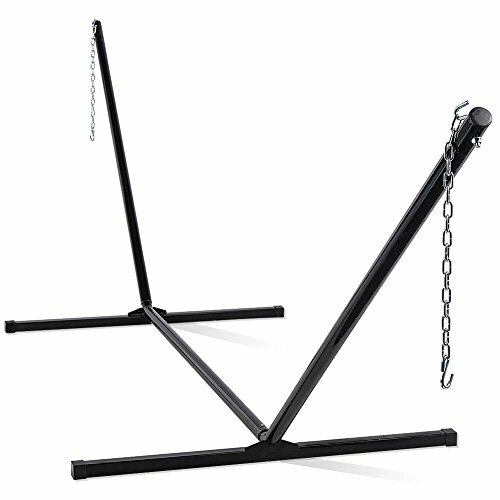 EASY TO SUPPORT - Constructed from heavy duty 12-gauge steel which allows the stand to support up to 450lbs. and ensures years of enjoyment. EASY TO MAINTAIN - Durable powder coating for weather resistance and rust resistance keeps it good outside for a long time, plastic caps protect leg ends well. Search ASIN B01HB9EBD4,B01BGSATGY,B01BD9L3JS,B01IBJU34E,B01D1BR2DM,B01LPSXY80 to get matched Hammocks. Do you always leave assembly processes for your husband to do because you usually find a way to mess it up? Free your husband with this easy to assemble steel stand. Its assembly is a breeze that only requires connecting the poles with the simple push button fastener. So you will be relaxed in no time. Its 15-foot length accommodates spreader bar hammocks measuring 12 to 15 feet. With two 20.5″ steel chains at each end of the stand, you should have no problem fitting more kinds of hammocks, such as a camping hammock. Depending on your stylish setting, the stand is available in multiple finish options so you can find your best fit here. – Gross Weight: 56.9 lbs.